In case you haven’t heard about it, since the 1st of this month, a marvelous annual challenge has been developed. In this challenge everybody is happy pedaling in unison around the world. #30DaysbyBike is a challenge which is developed in Barcelona and other cities during the month of April. It consists in taking advantage of all our trips through the city in order to ride the bicycle and promote the use of this marvelous means of transport. The only thing you have to do is sign up on their web page (you can access it through this link ) and you will be collaborating with this great initiative. In addition, you will participate in the contests which make it more interesting. Why do we try to participate in some ways every year? Because we are pedaling through Barcelona the whole year and we know that is a big pleasure getting to know its streets riding this clean and healthy means of transport. For this reason, we are sure about the fact that, if you are not pedaling daily and you start with this initiative of 30 days, after that your will not be able to stop it. After 10 years of pedaling through the streets of Barcelona without any rest, we are extremely proud of all the things that we have learnt about the city, about the people who live here and about all the people who have decided to visit it with us, that is to say, visiting it from another point of view: at a street level, riding a bicycle and enjoying every single experience firsthand. During these years, we have told you a lot of times how much we enjoy our job, because the best way to experience it is sharing this experience, showing, advising and accompanying all the people who have come to our shop. Because of that, we want to thank them for all we have received and how much we have grown professionally. 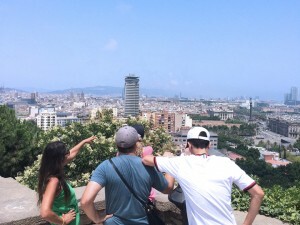 To experience Barcelona from its culture, tradition, architecture, gastronomy and from the ecotourism is something that doesn’t have a price and 10 years of experience of all these branches have made us really rich. Because of that, we are waiting with open arms for all the new experiences which are coming, in the same way that we are waiting for all the people who we will meet riding the bicycles of Born Bike Tours Barcelona. Some weeks ago we informed you about the new regulation which has been applied this January, month dedicated to the bicycle circulation in Barcelona, so, today, we are going to present a reminder just in case you have forgotten it. From the very first of this month of January 2019, the cyclists must circulate away from the sidewalks in Barcelona, in order to ride through the almost 1,000km (620 miles) of the city’s bike lane. And, why do you have to circulate away from the sidewalks? Because the cost of riding a bicycle on the sidewalks could be punished with fines of up to €500, so, save yourself this fine and the annoyance following this simple cohabitation rule. We want to remind you that the only way allowed to circulate on the sidewalk is when it measures a width of more than 5 meters and 3 meters are free (and you haven’t any other alternative or bike lane closer) or if you are younger than 12 (years old) and you are circulating with your own bicycle and accompanied by an adult. And returning to our wise words: Even if you usually pedal through the streets of Barcelona or because you are visiting this great city, remember, share and obey this regulation. 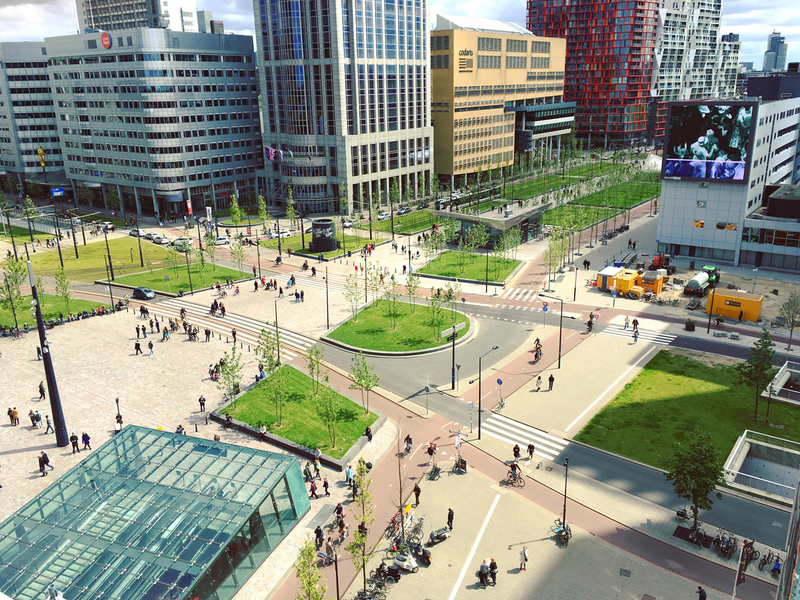 All together we are building a healthier city and a good cohabitation is one of the keys. After the extension of the bike lane in the city, almost 1,000km (620 miles) adapted to the bicycle circulation, the City Hall of Barcelona considers that the bike circulation through the road is safe enough to forbid the circulation of this vehicle on the sidewalks. The City Hall of Barcelona is in the middle of a campaign in order to make public, to every urban cyclist, local and temporary ones, that, as of the 1st of January, the circulation on the city’s sidewalks will be punished with fines up to €500. Their motto, “When you are riding a bicycle, leave the sidewalk”, is covered by a second slogan: “You have almost 1,000km of alternatives”. The only way allowed to circulate on the sidewalk is when it measures a width of more than 5 meters and 3 meters are free (and you haven’t any other alternative or bike lane closer) or if you are younger than 12 (years old) and you are circulating with your own bicycle and accompanied by an adult. Even if you usually pedal through the streets of Barcelona or because you are visiting this great city, remember, share and obey this regulation. All together we are building a healthier city and a good cohabitation is one of the keys. The number of urban cyclists in Barcelona has an exponential growth thanks to the extension of the bike lane during these last years in Barcelona. The security that these lanes provide is translated in a lot of people who enjoy the advantages of moving around with this very sustainable vehicle. Any person who has ridden a bike any time of his/her life will be realized that when you move the pedals backwards it’s useless. The bicycle has been designed for moving forward and if you need to go backwards you will have to do facing it, being fully aware of what you are doing and where we really want to go. And, why is so interesting this consideration nowadays? Because in our 10 years of experience pedaling through the streets of Barcelona we feel astonished (in the good sense of this word) about how the kilometers of the bike lane in Barcelona have been so extended and, especially, how a lot of urban cyclists have leaped to take advantage of even the last signalized meter of lane. The bicycle will continue advancing in Barcelona and it is going to do that in a conscious and safe way, transforming the city in a cleaner, more tranquil and more sustainable place each time. This last week, in Barcelona and in Catalonia, the temperatures have suddenly fallen and with this descent the rain has come too. But this doesn’t to be a reason for stopping pedaling in the city. In Barcelona, as a Mediterranean city, we have a really nice temperature which allows us to pedal without any problems, and if you don’t believe us, ask our neighbors in the north of Europe, where not even the snow can stop them. For this reason, we shouldn’t stop pedaling during the cold days, because, in addition, with the movement and the sport that we do riding a bicycle, we will again feel the warm sensation that we usually miss. That’s why our first tip is that you should wear different layers, such as an onion, because, at the same time that you are feeling warmer your body will need you to remove some of these clothes layers. Second tip, you should prepare yourself in order not to be surprised by the rain. Use waterproof clothes (also trousers) and also suitable shoes. Third tip, something that you always have to keep in mind, whether it’s raining, snowing or it’s a really sunny day: you should keep your bike ready. Clean and greased chain, pumped up wheels (you can deflate a little bit your wheels if it’s raining in order to achieve a better adhesion, but not too much, because you could suffer a puncture), front and back lights and, in addition, it’s interesting to use a mudguard, because we will arrive at our jobs more decently. If we follow these tips and we keep alert, we even will enjoy the cold and rainy days! Who usually use the bicycle for moving around the city have another point of view about it. Ride one and stir up your life. The continuous pedaling changes many things. We can assure this because we move constantly around Barcelona by bicycle. For us the bike is a physical revolution, but also a mental revolution. That’s physical in the sense of the health exercise as the reward of our work, because of the reduction of the CO2 and because the completely change of the city’s view. For us, several noiseless bicycles going through the streets is a present for the eyes and for the ears, especially if we compare it with the motorized vehicles traffic. But we cannot forget the mental revolution. The exercise and the simplicity of the bicycle release your mind and it allows you to observe around. And that’s a really good exercise to make you reflect and inspire. If you not agree with us, ask to the people who usually meet every first Friday of the month to ride their bicycles in Barcelona. The next excursion will depart from Arc de Triomf. 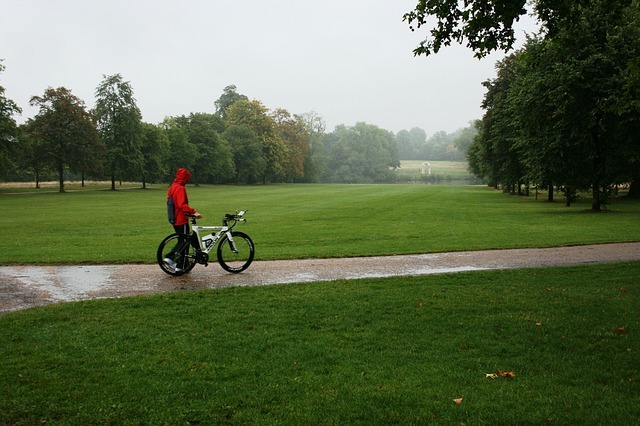 Autumn comes with rain in the city, but for the people who love to ride a bicycle, this is an unimportance challenge, because, finally, the rain cleans and purifies the city. What else can we ask for the people who like to breath clean air? Today, this post is for thank you for keeping pedaling this raining days in Barcelona or in any single city. For understanding the importance of this meteorological phenomenon in the city. For keeping calm and patient with the other drivers. And for being alert with the segurity, because this is very important these days. The rain in Barcelona is not so usual than in other cities, because of that, during the week days, when the traffic jams in the city is normal, the rain could be a nuisance. For this reason, we should keep this though in our mind: the water from rain cleans and purifies the environment because it drags away the damaging particles. And for everyone who breathes the city air daily this is the key. In addition, if we have the suitable equipment (nothing very especial) and we keep alert, the rain won’t be and impediment to pedal. Appropriate equipment, waterproof clothes, a footwear which resists rain without problems and all the elements which make you being more visible, especially for the motor vehicles: reflective clothes, the front and the back bicycle lights. A back mudguard will avoid you to arrive at your destiny with your back full of mud. Get your bicycle ready, you can help to improve adhesion on the road by reducing the tire pressure (a little bit! If not, you will be in danger of getting a flat tire) and be sure that the treads of your tires are well marked. It is also important to maintain the chain clean and lubricated. And, specially (with or without rain), check if your brakes respond quickly. The rainy days are perfect to show our skills with the bicycle. We are talking about reinforcing your concentration on the road. Brake before a curve and take it slowly. Keep a safety distance with regard to the other vehicles; avoid puddles, marks painted on the road and the multicolour marks that appear on the road (they are car oil). 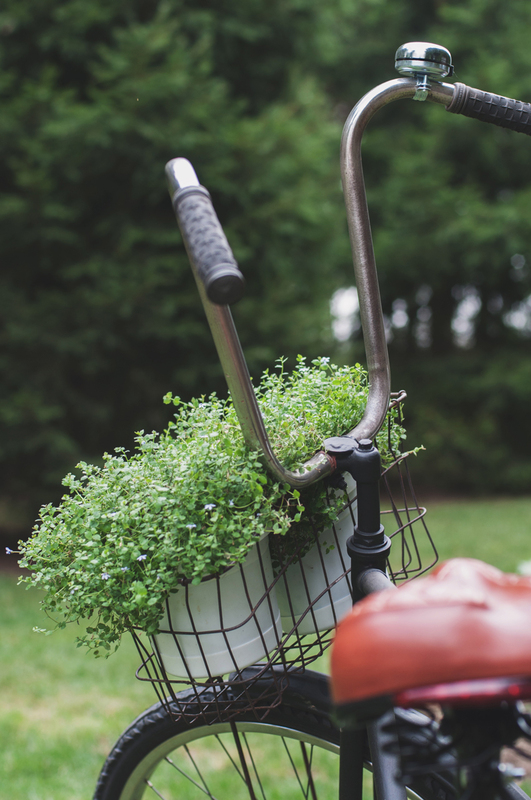 With these tips, the only thing that we want to repeat again is: thanks for keeping pedaling. From the 21st to the 24th of September, you have a very important date with Barcelona, in order to enjoy the cultural activities that the city has prepared only for you -well, and for other miles of people too-. As we always say, the best way to get to know a city is introducing yourself in its festivities, because popular celebrations are the best show of the local’s environment, their culture, their tradition and their gastronomy. In Barcelona, the most remarked festivity -because each neighbourhood has each own festivities- is La Mercè celebration. And this year it will be celebrated from the 21st to the 24th of September. From expositions, “cercaviles”, castellers, giants, sardanes to the night concerts and light shows. You should be fit riding the bicycle, if you want to arrive at everything! 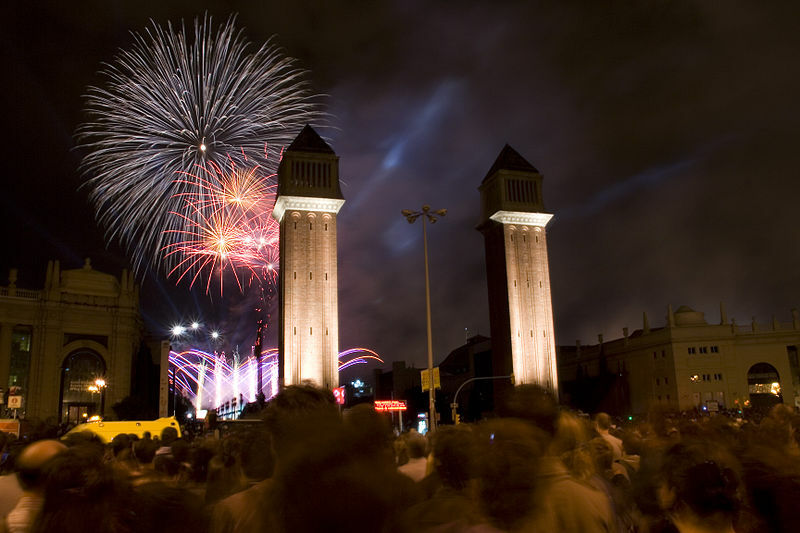 Take a look to the daily activities programming in https://www.barcelona.cat/lamerce/en and take the most advantage of this celebration. You only can enjoy it once a year. This week a lot of kids are going to start again the school studies and that means a clear return to the routine for a lot of people. But, this time, if you haven’t tried it before, you can add a refreshing change to this routine, it consists in returning to the school by bike. Barcelona is every time a safer city when we talk about riding a bicycle through its streets, all this thanks to the extension of the bike lane. So, why don’t take advantage of this situation and be an example for the little ones using the cleanest means of transport? This video that we have used other times (yes, we admit it, we thrill every time we play it) shows how this situation can be absolutely normalized and a main situation, so, why don’t we try it? For us, this is a mantra, we should work in order to Barcelona become a cleaner city by including the bicycle in our routine, being an example to the future generations. Then, this new school year, are you going to join our club? That’s free and very healthy! If this summer you are ridding a bicycle though the streets of Barcelona, you shouldn’t miss to get to the Great Fiestas, the best show of culture and tradition in the city. During summer, Barcelona doesn’t stop, on the contrary, that’s really strange to find a week without any Great Fiesta. Next, a brief calendar with which you can check if your trip to Barcelona coincides with a neighborhood’s festivity. Festes de Sant Roc from the 14th-18th of August. Festes de Gràcia from the 15th-21st of August. 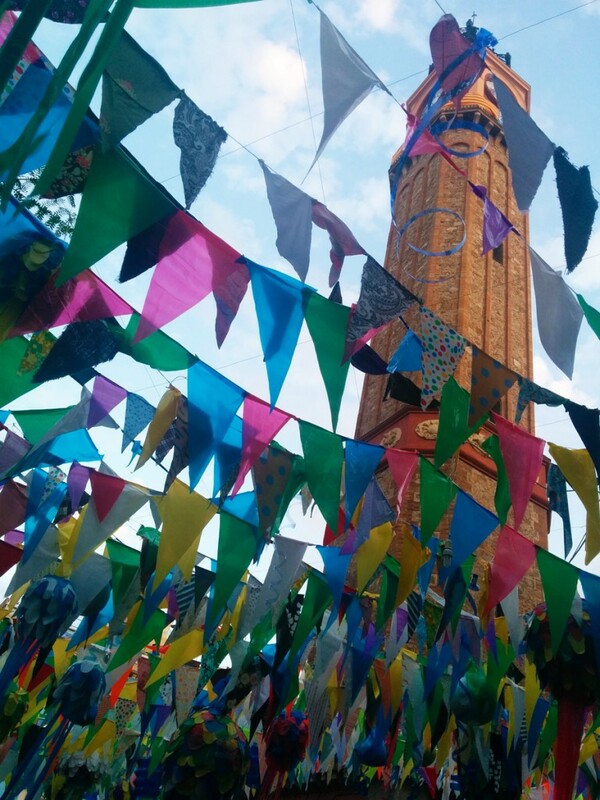 Festes de Sants from the 20th-28th of August. Festa Major de la Bordeta from the 28th of August to the 15th of September. Festes de Vallcarca coincides with the first two weeks of September. Festa Major del Farró from the 7th-11th of September. Festa Major de la Barceloneta, coinciding with the Sant Miquel festivity, around the 29th of September. Festes de la Mercè from the 21st to the 24th of September. Try to confirm this calendar in the City Hall web site, when the date comes closer. Some variations could be possible. And, above all, enjoy this amazing fiestas! Here you have a list of activities in Barcelona during this August, in order you don’t miss anyone during your trip. The Mas i Mas Festival returns to Barcelona in the summer with jazz, flamenco, classic, techno and much more. The DGTL Festival will make you dance in Barcelona at the rhythm of music house and techno. This season, 2018, the program includes 49 concerts and all of them free. From June to the end of August you can listen to music in the parks of Barcelona. These have been taking place for the past 15 years and include best quality music. Not only this, it is also great for sitting in a pleasant place at night with good music, friends and family. Take your picnic basket, your plaid table cloth and get ready to …. Dance without stopping until the 17th of September.. In summer we all want to spend a lot of time outdoors -and what a better way than watching short films with friends while having a glass of wine. Mecal Air is a summer alternative to the classical cinemas, It is the one preferred by the Barcelona neighbors. The good part is that there is a combination to “short films” and a gastronomical offer. The entrance is free. Important recent films and concerts that take place outdoors. Free movies at the beach during the summer nights. In the summer from Thursday to Sunday from 9:00p.m to 11:30p.m. the spectacles take place every half an hour. Don’t miss the most fun gay Festival in Barcelona. Experience the Barcelona Football Club Joan Gamper a the Camp Nou! With the inauguration of the bike lines in the streets of Bilbao and Jonquera, which have been added to the street of Navas -look at the map and you will understand it better -, the axis which will allow us to go from the Parc del Guinardó to Marbella beach is completed. Something very especial from Barcelona that we always try to remark is that this city is a sea and mountain city, where the landscape and the environments are very varied and it allows us to enjoys its different modalities. Up to now, a very important bicycle route was the one where you can go from the Port Olimpic to Montjuïc mountain in the Sants-Montjuïc district. In just one day you can enjoy the sea breeze and the mountain views. Now, to this amazing route, we have to add another one from Guinardó to the Marbella beach, so we have a new one for changing the views and the environment of the beach. The most important thing of these routes is the fact that now we can do that in a safe way thanks to the extension of the bike lane in Barcelona. 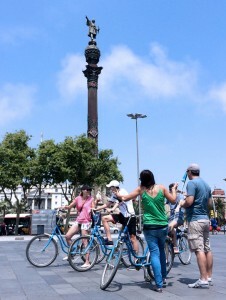 This summer experience Barcelona to the maximum and discover the last of its corners by bicycle. This summer you shouldn’t forget your bicycle at home. It will be your best trip mate. If you have kept yourself fit all year getting around everywhere by bicycle, this summer you cannot waste all this effort. Moving around the cities by bicycle is the best investment that you can make. With the bicycle, you can get to know all the cities at street level, without any problem when you decide to park, and enjoying the city environment directly. The respect for the environment, the noise and the neighbors are synonyms of bicycle. This will make you earn points with the local people who are sharing the city with you. Flexibility of movement, especially in Barcelona, city of sea and mountain. By bicycle, the moment you wake up, you can decide if this a mountain or a sea day. It will make you enjoy the trip and allow you to stop anywhere you want. It doesn’t matter if you want to immortalize the moment by taking a photo or if you want to have some tapas -Spanish appetizers- in a bar that you like. All these advantages, combined with the bike lanes which the city is taking from the space of the cars, make the bicycle the best trip mate during our summer adventures. Are you looking for culture, gastronomy and tradition in Barcelona? Here you have some suggestions for this weekend, come by bicycle! After some years, the Sant Antoni Market opens its doors to the public and it does that on a large scale. 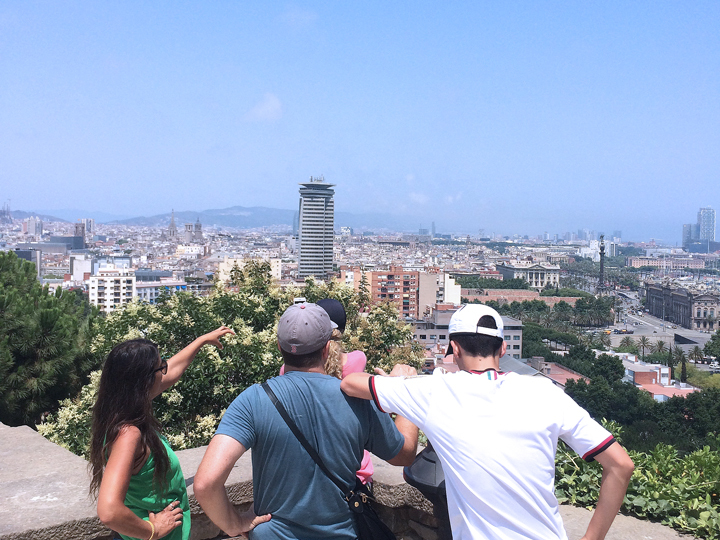 One unique opportunity to move beyond the center of Barcelona and surround yourself by its culture. 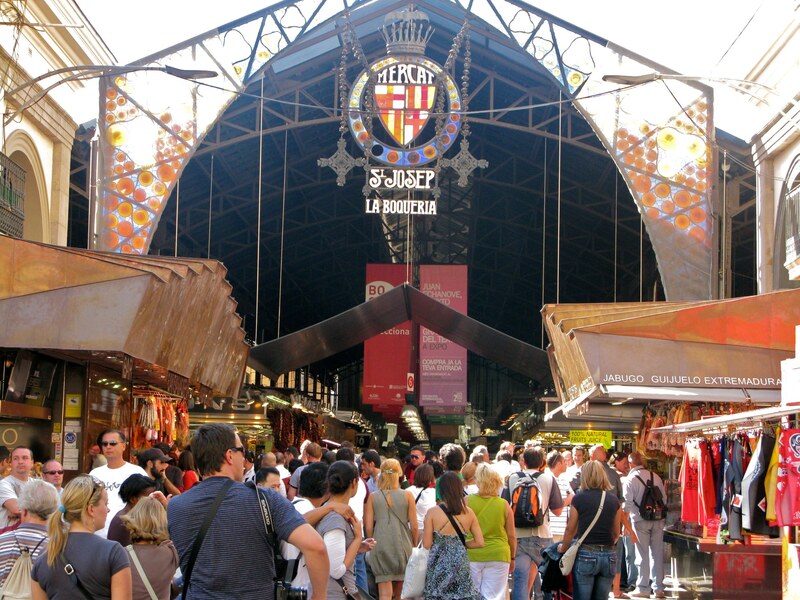 In many other mails, we have insisted that, if you are getting to know the city, a visit to the markets of Barcelona is indispensable. Because of its architecture, its traditional products combined with the modern gastronomy of the city, because of the interaction with the local people… But, specially this weekend, the Sant Antoni Market is going to celebrate a great inaugural party, where all the ingredients which we have mentioned before are going to be complemented by sport, musical and dance exhibitions, workshops for kids, poetry, art and culture. If you are visiting Barcelona and you like cultural immersions, you should not miss this opportunity. Ride a bicycle, for us the best means of transport in the city, which will transport you directly to the activities, through the bike lane of the Compte d’Urgell street -the one that goes through Ronda Sant Antoni, the location of the market, is under construction-. 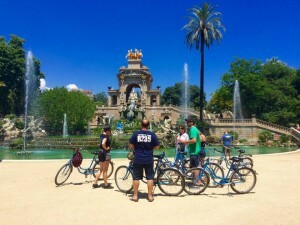 Barcelona never stops, take advantage of that by bicycle! We love to talk about how useful is going around Barcelona by bicycle, but, what do de know about this incredible and, at the same time, simple means of transport? Here you will find some interesant notes about its history. 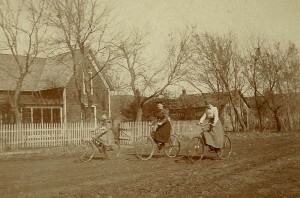 There are many different histories of the bicycle. One source claims that it has a history that goes back about 600 years and is quite different than the bike as we know today. Another day we will speak about the source that claims the history of the bicycle began in 1815 after a large volcano, Mt. Tambora, erupted in present-day Indonesia. 1418 – Giovanni Fontana builds the first human-powered land vehicle. It has four wheels and uses a rope connected by gears to the wheels. 1790 – Comte Mede de Sivrac invents the celerifere. It has two wheels and a seat, but no steering or pedals. 1817- Karl Drais invents the steerable “Laufmaschine”. 1866 – James Starley, a British engineer, invents the penny farthing. 1870’s – The unicycle is invented. 1878 – The first portable bike is made by William Grout. 1879 – Henry J. Lawson patents the bicyclette – a rear wheel, chain-driven safety bicycle. 1880’s – The adult tricycle is invented and offers a more dignified alternative to its high-wheeled counterpart. 1885 – John Kemp Starley invents the Rover safety bicycle in England. 1894 – Michael B. Ryan is granted the first patent for a folding bike. 1924- The velocar is invented by Charles Mochet. 1933 – Cruiser bikes are invented and sold by Schwinn. 1979 – Joe Breeze creates the mountain bike. 1989 – The Sanyo Encale electric bike is released with NiCd batteries – a big advancement from lead-acid batteries. 1989 – Michael Kutter develops what is considered to be the first pedelec, an electric bike where pedaling causes the motor to assist the rider. 1991 – The conference bicycle is invented. I would like to share what Ernest Hemingway said about riding a bicycle. The beginning of Spring has come accompanied by a cold snap and by a bit of snow. Here we are going to explain how you can manage this situation. Today, the typical conversation about weather makes sense. From the start of the week the decrease of the temperatures has become noticeable and this Tuesday it has arrived accompanied by a snow alert at minimum levels. This doesn’t mean that you have to leave your bicycle at home, if you usually use it as your habitual means of transport. With the correct kit, the bicycle will help you to keep yourself warm. When you dress, you should use the onion trick, which means wearing various layers of clothes. You will start to pedal warm and at the same time that you get warmer, you will be able to remove the different layers of clothes. You should use a neck gaiter to protect your face, the wind is a bit cold. Wearing waterproof clothes is very important, and this is not only important for protecting your torso; it is also for protecting your legs. Although at this moment it is not raining or snowing, if the streets are dirty, you will avoid mud splashing your clothes. Finally, make you sure that your bicycle is in a good shape. A professional service is always useful. But, the most important thing is being sure that your chain is clean and lubricated, that the breaks work well and that the wheels are not deflated, because you could have a flat tire. With these tips you will be able to arrive anywhere and you will avoid the typical traffic jams of these days when everyone takes car. ‘Bicia’t’ certifies the ‘bicycle friends’ buildings, which favor the bicycle use among their workers and prepares a recommendation guide. As we have talked about since quite some time ago, Barcelona is working a lot on the sustainable means of transport matter. And, which is one of its preferences? The bicycle, a means of transport without contaminant emissions, which keeps you fit, which adapts itself to your life and gets you into harmony with the environment of your city. One of the ways that the City Hall has found to promote this means of transport is through rewarding everyone who works in its same line, with the creation of various grants and promotional programs. In this case, we are going to focus on the Bicia’t program of the City Hall of Barcelona in collaboration with BACC -Bicicleta Club de Catalunya-. If you are used to going to go to work by bicycle, find out about the activities of this program, because it could help to add more work mates to your cause. With Bicia’t, the City Hall certifies the “bicycle friends” buildings and it recommends a necessary remodeling for achieving the highest emblem. In addition, it promotes the bicycle use with free bicycles for hiring, circulation and mechanical training, organized excursions, parking installations and so on. ¿How many reasons do you need to join this movement? The healthy movement of cycling. There are a lot of reasons for using bicycle as the usual means of transport, but one of the most important ones is the reduction of pollution. And which is the other element that helps to clean the city? The rain. If we usually take the bicycle to move around Barcelona, it is possible that when you wake up in the morning and you see that it is raining you feel a bit irritated. For this reason, we suggest you to focus on this idea: rain is an indispensable factor to reduce pollution in the city, so don’t consider it your enemy, consider it your ally. The water from rain cleans and purifies the environment because it drags away the damaging particles. And for everyone who breathes the city air daily this is the key. The World Health Organization (WHO), in its report WHO, GBoD 2016, estimates that “some 3 million deaths a year are linked to exposure to outdoor air pollution”. This profound exposition to a high level of pollution could cause: an increase of allergy among the population; a development of cardiac illnesses; respiratory diseases, etc. So, take advantage of every rainy day wearing the suitable bicycle equipment for these days and enjoy this phenomenon, which is very necessary for life. Ok, no, the European City Challenge is not here yet, this great event is in May but, we have spent 31 days since New Year Eve’s. Have you achieved all your proposals? If your answer is yes, congratulations! And if your answer is no, don’t worry, you still have 11 months for achieving them. We suggest some ideas to you. For starting, we only want to remind you of the three main questions that you have to raise again: Are your intentions specific enough? Do you have a deadline? And, are these realistic? We insist on these questions because, for us, they are the key when you want to achieve solid intentions. We are going to give a random example: “Doing more exercise for keeping us fit and healthy”. It is a great initiative, but is a bit generic and you can achieve it in a lot of different ways. With the first question and basing ourselves on our routines, we can develop different task. For example, going to work by bike, shopping healthier proximity products, and practicing ecotourism pedaling during this summer… easy, right? Now, consider the next question: do you have a deadline? In this case we have task that we want to apply to our routines so, talking about time, the most important thing is getting us firm doing that during a month. We are sure that if you spend 31 days pedaling through a city like Barcelona for going to work, you will not be able to leave it. And, finally, are they realistic? If you imagined, when you decided to do more exercise, that you could spend 2 hours in the gym everyday… Well, maybe you will achieve that, or probably, after one week you will miss too many things that you have given up for spending more time in the gym. We hope that all these tips will help you for achieving your goals or for following them, because reaching the target, in these cases, is a big pleasure. In 2015, the City Hall of Barcelona promised us 308km of bike lane, nowadays the city has 184km and, although the final goal for the end of the year is lower than the first one -233 of 308km-, the 89% of the citizens of Barcelona already have a bike lane at a maximum of 300 meters from their homes. The City Hall of Barcelona can already boast that in the last two years they have extended the cyclist infrastructure of the city, also improving the security. And this is something very important to promote the use of ecological and alternative means of transport such as the bicycle. We have already noted this promotion because, according to the information of the City Hall, between 2015 and 2016 the average of urban cyclists increased by 14%. The fact that the City Hall continues betting on bicycles is something we all have to work for. Going to work by bike means a healthy routine, getting fit and an ecological benefit for the whole environment of the city. If, some days ago, we were elaborating a never-ending good intentions list for the new year, surely, with the return to the routine, this list becomes a hill. But don’t give up hope, here you have some tips, in order to don’t throw in the towel. Achieve our good intentions list is not an easy work. We want to formulate 3 questions, which will help you to reach your goals. Are your intentions specific enough? Preparing another sublist with the specific and definite tasks, which we have to achieve in order to reach our goals, will help us to see our way easily. 365 days are a too many days. If we delimit a clear date to every one of our task in our new calendar, we will be able to review all our progresses. The goals, the task and the deadline. Only us are conscious about our limits, but sometimes we err being too much optimistic. If you demand too much of yourself, it is possible that you feel overwhelmed, so, if you have too many intentions, leave some of them for the next year, you have all life for doing that! Going by bicycle to work, in order to improve your environment. Practicing the ecotourism during your next trips. For this new year, we wish that you achieve all the goals that you have decided. After Christmas Day and the New Year’s Eve, there is another important moment of these days: the arriving of the Three Wise Men. What are you going to wish for? We will explain how to contact with them here. If you are one of the persons who has been doing things in an unlimited way these last days –eating non stop, visiting your family and playing games with the kids-, surely, the first thing you will wish for is some outdoor activities. These days Barcelona is full of activities referring to the Three Wise Men, because the people can walk through its streets and enjoy the last days of Christmas. The Three Kings’ toy factory will be active until the 4th of January at the “Fabra i Coats – Fàbrica de Creació” facilities. Do you know anything about this place? It is a spectacular industrial building in the district of Sant Andreu, which has been remodeled to become a place full of activities, where different businesses and projects live together. Take advantage of this event to leave the center and discover a bit more of this city. In addition, you will enjoy a tour full of magic and you will see how the letters to the Three Wise Men are transformed into presents. You can also deliver your wish list to the helpers of the Three Wise Men, Estel and Omar, who are at Plaça Catalunya from Tuesday to Thursday, in order to assist the Three Wise Men with their work. The end of the year is closer and with that our reflections about Christmas in Barcelona, pedaling our bicycles, increase. You can contact with the Three Wise Man by email. Girls can order race cars and boys can order kids’ play kitchens. An original present is the one which is related to sustainability, education… There are a lot of examples about what we can find nowadays at Christmas, which shows that we are making progresses for a more equal and sustainable future. In Barcelona, we are maintaining the tradition, but we also make aware about that, because this is not based on consumerism nor discrimination. So, in order to don’t miss this tradition, it is important to maintain the basic values, either at Christmas, at Carnival or Halloween. So, we couldn’t avoid to do that, we have related a good Christmas with a bicycle. The bicycle is for everyone, without regard gender or economic level, because we can find it with a very affordable price. It can be adapted to any situation easily. It is completely sustainable, it doesn’t contaminate or waste. And the energy that moves it is ourselves. If you are agreed with these values, make the exercise of comparing your Christmas with your bicycle, what else do you want for your celebrations? Only in the U.S. more than 6,000 cyclists need emergency care for head injuries each year. Choose a well-fitting helmet. A good training could be only to pedal about 30 minutes on flat terrain during the first three or four weeks. 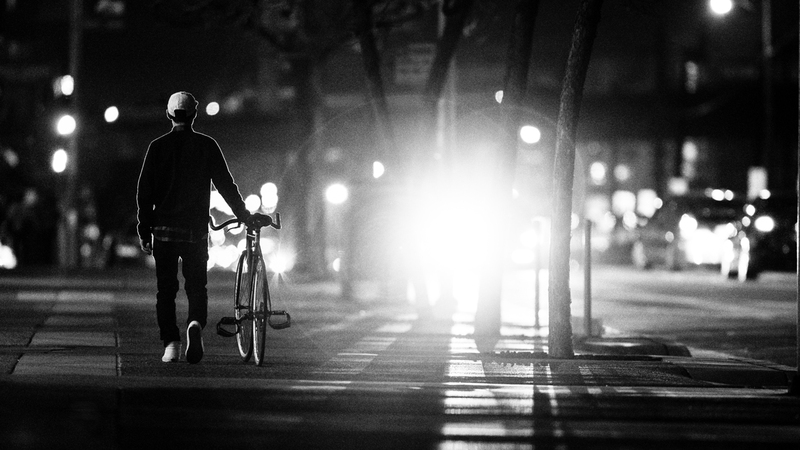 Try not to ride at night, but if necessary, make use of the lights. Respect all traffic signs and norms. It’s well worth while for everyone. If there is heavy traffic, ride in the lane with the cars, not to the side. For optimal pressure, put your hands at the ends of the levers. Apply firm pressure to the brakes. Try not to pedal in high gear during long periods to avoid pressure on your knees. Taking these simple tips into account, you’ll get more enjoyment out of biking! Pedaling through the parks and gardens in Barcelona, the green zones that you shouldn’t miss! Barcelona, sea and mountain city, takes care of its green lungs and turns them into a perfect places where take a walk and refresh yourself during summer. 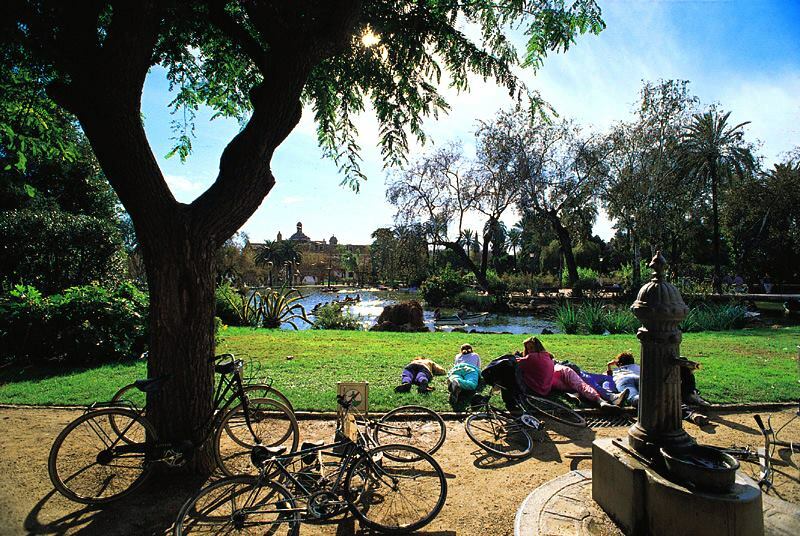 In our opinion, this is the number 1: Parc de la Ciutadella. Why? Because it has a perfect access for bicycles and converts it into one of our favorites places in Barcelona. More than 17 hectares where you can walk, ride, look it over, stop to rest and, even do some rowing, because the park has a little lake. Although, if you really want to get away from the city, there are two parks, which are very special for us. On the one hand, we have the Laribal’s Gardens, situated in the district of Sants-Montjuïc. We can get there on bicycle, even though, we will have to park it at the entrance. There, we will be able to enjoy the great vegetation and the different ponds and waterfalls. In addition, we shouldn’t miss the famous Font del Gat (The Cat Fountain) and getting to know its legend. And, on the other hand, we have the Horta’s Labyrinth in the district of Horta-Guinardó. This is the oldest park of the city, but it preserves a great beauty in its vegetation, streams and statues of mythological characters. Soon, the city will have a new green lung in Glòries. The City Hall of Barcelona has already presented the project of a great park which will give life to this end, which, until now, has been a grey point in the city. This week, the City Hall of Barcelona is working very hard to avoid the mobility and access problems to the giant congress of mobile technology. We, riding our bicycle, haven’t noticed it. Barcelona is the headquarter of the Mobile World Congress since 2006 and, since this year, the mobility and the access to the city have been the greatest. Speaking of public transport, the underground and the bus lines are completely packed. Speaking of taxis, we find a frenetic movement. But, speaking of bicycles, a luxury. In counterpoint to the frenetic rhythm which seems that Barcelona is experiencing Barcelona as the headquarter of the newest technologies, we are there, and we are enjoying the city through the streets without stress nor masses. A nice image that we want to share with everybody who hasn’t yet planned a rest, such as we have, during this week. Our tip for this week: relax yourselves with a great stroll by bike through our parallel world in Barcelona. We are not tired to repeat that the bicycle is the best means of transport in the city. And here we have the news that confirms this premise, but this time we are not only talking about moving ourselves, we are talking about moving products. The City Hall of Barcelona, together with the Rezero organization, has promoted the Comerç Verd, Comerç + Sostenible initiative –Green Business, Business + Sustainable. With this initiative, the City Hall pretends to make public and spread a great number of testimonies, who work producing 0 pollution. The bicycle couldn’t be out of this project. For this reason, we find a couple, Marina and David, who are the owners of Freefood, an alimentary products shop. They base their contribution for improving the environment, in the distribution of these ecologic products with their bicycle. In addition, they make discounts to the clients who go to their shop by this means of transport. We encourage you to look at the video, where the protagonists of this story tell you the advantages and the importance of the bicycle in the city. (We are sorry, it is only in Catalan, if you have any doubts, contact us by our social networks). ¿Have you been convinced? Tomorrow, you can be who contribute for a better city. Improving the environment of the place where we live by reducing the pollution, the noise and the stress is important. But, for maintaining it, educating the youngsters with good habits is a basic thing. This post has been inspired by the initiative of the neighborhood of La Sagrera in Barcelona. From the 17th of November, this neighborhood is celebrating its great fiesta. And, among performances and activities, we have wanted to emphasize the children’s bicycle race, which will be celebrated on the same day of the closure, this Sunday, the 27th. In this race, which will take place in the Pegaso Promenade, the participants will be between 5 and 14 years old. And, so that none of them lose the will to participate, in addition to the common race, the “snails” race, where the winner is going to be the last one, will also be celebrated. This great initiative will motivate children to enjoy their streets, as well as to introduce themselves into some healthier habits, with which to enjoy the journey and the everyday life a bit more. Do you have any plans for this weekend? If you have a Brompton folding bicycle and 15 euros saved, take a look at this initiative to collect money for the Movember Foundation at the Barcelona-Catalunya Circuit. Some months ago, we talked about the curious Brompton World Championship, which will again be celebrated on the 22nd of April this coming year within the BiCircuit Festival frame. In the same line, this Saturday, the 19th of November, the Solidary Vermouth with Brompton will be celebrated. At 12.30 p.m. participants, with their Brompton being ready, will meet at the Circuit and at 13 p.m. the lap around the circuit will start. After enjoying the pedaling over the asphalt track, all the participants will be able to recharge batteries with a luxury vermouth at the Privilege Corner building. So, now you know that, if you don’t have any plans for this weekend yet and you are close to Barcelona, don’t doubt about signing up for this solidary action and training for the next Brompton World Championship. Which is the evolution of the bike lane in Barcelona? Almost one year ago, we published ‘If we were already enjoying Barcelona, we will do it even more in 2018 with the 308km of finished bike lanes’ and, after these 345 days, the issue of the bike lane in Barcelona is still in the spotlight. 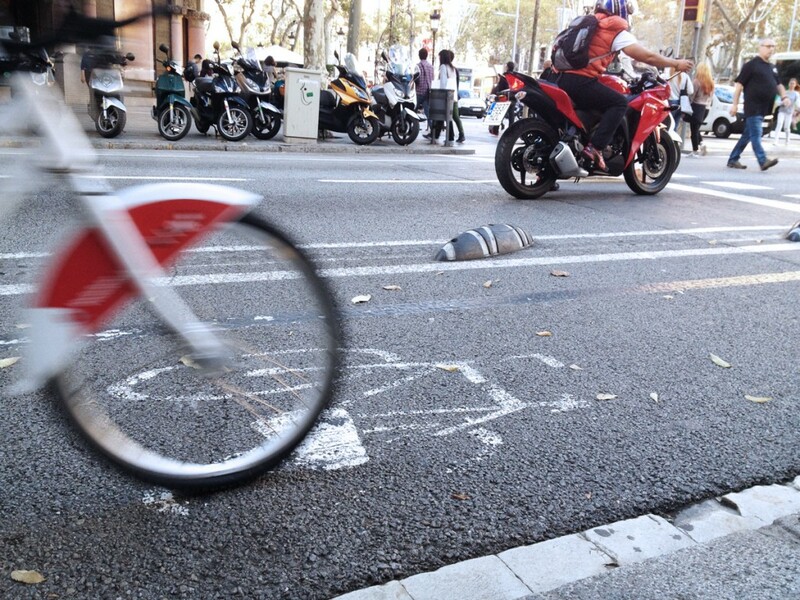 These days, the City Hall is working on the bike lanes of the following streets: Marina, Travessera de Gràcia, Cartagena, Eduard Maristany, Taquígraf Serra and Gelabert and on the connection of Barcelona with Esplugues del Llobregat. On the other hand, with regard to the streets of Joan Güell, Can Bruixa, Marquès de Sentmenat, La Jota, Múrcia and Numància, the bike lane is working at full capacity. The Numància street bike lane connects, in both directions, the Plaça de Països Catalans with the Avinguda Diagonal, one axis more than necessary. But since its first use, some weeks ago, there has been a polemic between shop-keepers, drivers of motor vehicles and cyclists. The shop-keepers criticize the lack of space for loading and unloading products; the drivers, basically of cars, complain about lacking the parking lots; and finally, the cyclists are sick of vans and taxis which park on the bike lane itself. Another point that has also been conflictive these last weeks, is the delay referring to putting the prohibition of the bike circulation on the sidewalks into practice. This month of November this prohibition, which doesn’t allow bicycles to circulate on the sidewalks with a width of less than 4,75 meters, and with a minimum of 3 meters of free terraces for bars -although this does not affect children younger than 12 and people who ride the bike between 10 p.m. and 7 a.m.- had to become effective. For the moment, this regulation will not become effective until next year, because the City Hall considers that we are still lacking infrastructures which make the bike lanes safer for the bike circulation. All these changes have again opened up the discussion between cyclists and drivers. The first ones ask for more safety, the other ones are reticent to losing space. But, in our opinion, if we want a city with less pollution and at the service of people and not of cars, it is essential to improve the condition of those who work for this better future. Tradition, culture, music, gastronomy… everything you want to know about Barcelona is summed up from the 22nd to the 25th of September. One more year, Barcelona will celebrate its great fiesta, La Mercè, which, this year, is going to be celebrated from the 22nd to the 25th of September. And we will never get tired of repeating that: if you really want to experience the city the same as an authentic local person, a celebration like this one is the best opportunity for achieving this. So, if you are visiting Barcelona this days, you shouldn’t miss this. During the day, you will enjoy all the activities that you can imagine for all the family in the streets of the city. During the night, you will have the best local and international music concerts. A lot of people are going to come these days in order to enjoy and keep this amazing fiesta alive, are you going to be one of them? Remember, the 22nd is going to be celebrated as the Day Without Cars in Barcelona and the bicycle will take over all the importance in this city, maintaining it clean of fumes during this first day of the festivity. Are you going to come with us to pedal during the fiestas? During this week and the next week, coinciding with the great fiesta of La Mercè in Barcelona, we will celebrate the Mobility Week. It will be accompanied by a lot of activities for the awareness which we should have about our vehicles in order to maintain the city’s environment. The Sustainable and Safety Mobility Week in Barcelona, from the 16th to 22nd of September, is directly related to the European Mobility Week, in which almost 2,000 registered cities from different countries are participating. The goal is that all these cities organize different activities in order to awaken the awareness about a sustainable mobility model for everyone. In Barcelona, the bicycle, together with the going on foot and the public transport, will be the protagonist of this campaign. The week will culminate with the Day without Cars, during which the motor vehicles will remain parked, in order to allow civic centers, schools, etc. to occupy the road with their activities. This day is already a tradition in our city, but this year it will be more special. Instead of fitting it into a weekend, the Day without Cars will be celebrated during a working day Thursday. A risky bet of the City Hall, but surely that it will encourage a lot of people for taking the bicycle to go to work, reducing pollution and increasing the quality of life. 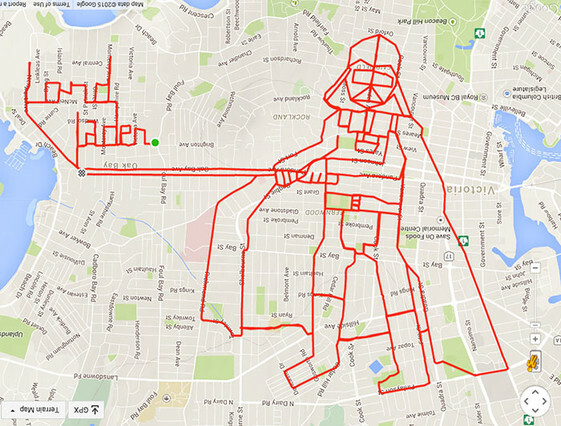 Cyclists from all over the world draw amazing figures through their GPS for sharing them later. 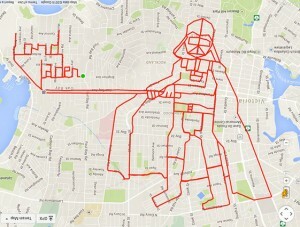 It is called Strava art. Other times, we have talked about mobile applications such as Strava or Endomondo which, in addition to being good tools for keeping us fit with our bicycle, are new social networks where we can share routes, record times which make us feel pride, among other impressions. But the thing that their inventors maybe never imagined when they programmed them is the fact that the users are taking an artistic advantage of them when they use the routes marked on the streets where they move around. Such as the expression “mente sana in corpore sano” predicts, there is a very narrow relationship between the wealth of our minds and the training of our bodies. In this sense, we want to make reference to this (we think that it can be already called like this) “movement” which, taking advantage of the digital applications, has transformed the cities into a big canvas. Cyclists of everywhere in the world plan and prepare a route which ends up in images (some of them really complex figures), which will finally be shared with friends and, even, with the rest of the world. If you are thinking about a new challenge, this is the best way to combine sport, art and new technologies. Such as was declared in the 19th century, by the North American suffragist, Susan B. Anthony, who had also traveled on bicycle, this vehicle had been one of the symbols of the women empowerment during this age. This fact had not only taken place in the United States, it also happened in a lot of other places around the world. A similar case is Great Britain, which has been thoroughly documented by Dr. Sheila Hanlon. Because it is during this century when the bicycle became a bold element which started a lot of debates: a woman could go from one place to another without the necessity of being accompanied by a man; the image of a physically weak woman was demolished; some clothes became uncomfortable for being used on the bicycle… some little changes which revolutionized a lot of aspects and won against the ridiculous theories, such as some of them the emerged from the medical sector, from where they alerted physical damage such as the sterilization or the abortion. A useless attempt for trying to control women. Although the evolution is obvious in a lot of countries, nowadays we still have a lot of work and tours to do. On this International Woman’s Day, we want to keep going this way with all the women on this historical symbol, the bicycle. The bicycle has been the protagonist on the big screen a lot of times, and we can find films for everybody’s tastes which, if we are tired of taking the bicycle, will again make us feel like going out again. Set at the terrible crisis which Italy suffered after World War II, the protagonists, a billsticker and his son, show us this reality while they try to recover the bicycle which was stolen during work. Because if nowadays going to work by bicycle can be a pleasure, for the protagonist it is indispensable. Also related to a stolen bicycle and the adventures that this fact unchains. Pee-wee, the outlandish protagonist, will gain a lot of challenges in order to recover his most precious jewel and at the same time, if we are fans of this kind of humor, he will make us laugh. The first film directed by a woman in Saudi-Arabian, protagonized by a girl with a clear conviction: with a bicycle she could arrive at the school faster and win races with her friend Abudllah. Until here everything could seem very normal, but in the Wadjda reality these kinds of freedom are not allowed for the women and the conventionalism which she questions is the law that governs the country. Who needs a motorized vehicle to move around the big city at full speed? This film achieves all the requirements of an action film: persecutions, attempted murder, inconceivable escapes, love plots, a lack of dialogs… The only difference: most part of the story takes place on a bicycle. Do you have clear ideas about which bicycle you prefer? ¿How could you win a good vacation by pedaling your bicycle every day? JAE Ingeniería y Desarrollo, a company from Logroño, La Rioja (Spain), clearly knows how to take care of the workers who make themselves responsible for the environment: even one week of vacation can be earned by them for riding the bicycle to their work every day. The importance of the workers’ motivation has been heard by a lot of companies and, each one looks for the best way to award the employees. This week we have found the company who, in our point of view, has won the first place: JAE Ingeniería y Desarrollo has thought up a system in which, for every day that you go to work with a non-motorized vehicle you accumulate 10 minutes of vacation and in this way until you have reached one week. In conclusion, a great system to thank all the people who are concerned about the environment, about the city and about the tranquility of a lot of people, because, in the end, what is more tranquil, quick and less polluting than a bicycle? This initiative is similar to the other one that the French government announced last October, which has not yet been put into practice, but which is planning to pay 0,25 cents for each kilometer ridden to work. It seems that the bicycle is going to continuously win more allies and maybe we, using it, will be able to earn some paid vacation, but, of course, on bicycle. Related to last week’s mail and in order to complete our safety guide a bit more, here you have a map and some tips to circulate through the bike lanes in Barcelona. It continuously results easier and safer getting through Barcelona on bicycle; this fact is thanks to the 200km of bike lanes in a lot of streets of the city which connect us with almost every district (it would only be necessary to have an extension through the peripheral zones). 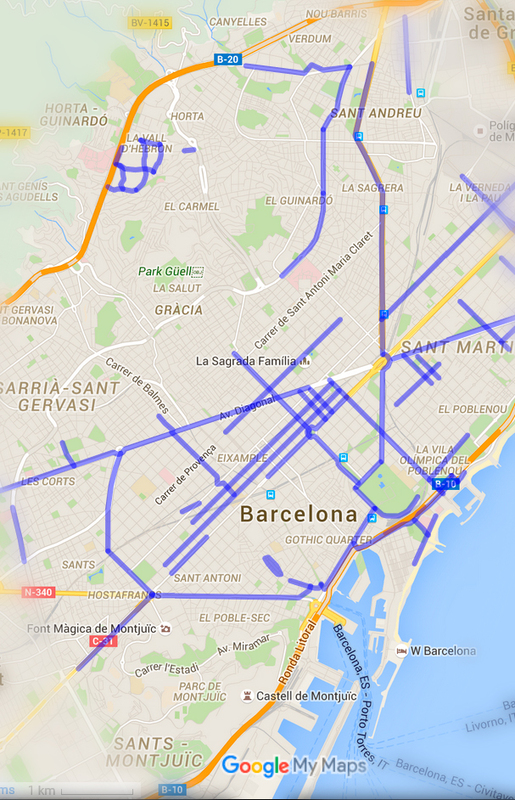 At first, if we don’t know all the streets exactly, Barcelona on a bicycle might seem quite big. For this reason we can access to this City Hall updated map of the different bike lanes. 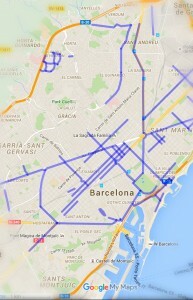 Although, if we have problems for getting orientated, and we want to consult if we are on the right way while we are circulating, we will be able to do that through our Smartphone thanks to the Google Maps application, which, among its different options, allows us to highlight the different bike lanes of Barcelona on our map. Signal your next manoeuvre with your arms for the benefit of the rest of the cyclists. You should circulate in the right direction: not every lane is two directions; pay attention to the direction of the road marks; it’s possible that you sometimes need to cross to the other side of the street. And, specially, keep calm with some pedestrians; warn them kindly if they are walking in our lane. They are almost never conscious about this error. Remember that at the crossings they have priority. To get to know more details, consult Article 14 of Pedestrian and Vehicle Circulation of Barcelona. Remember that our security is the most important factor for arriving at our destination! Starting with your clothes, always have a thick raincoat on hand; if you have a backpack, the raincoat should be wide enough to cover it (there are also trousers which you can wear over the ones you are wearing at the moment), It’s important to always keep dry in order not to arrive at your destiny with a cold. Your feet are important too. Be sure that your footwear resists rain without problems! In addition to raincoats, your clothes should be visible. Remember that inside a car the vision can sometimes be difficult. Try to maintain your bicycle lights in good condition, even though it is daytime and you have a good visibility, this helps others to see you. Equip your bicycle with a front mudguard to improve your visibility and a back mudguard so that, for example, you don’t arrive at work with your back full of mud. You can help to improve adhesion on the road by reducing the tire pressure (a little bit! If not, you will be in danger of getting a flat tire) and check that the treads of your tires are well marked. Maintain the chain clean and lubricated and check if your brakes respond quickly. Emphasize the attention referring to the habitual precautions: brake before a curve and take it slowly. Keep a safety distance with regard to the other vehicles. In addition to these, you have to take other new precautions: avoid puddles and the road edges (there is usually lot of water there); keep an eye on the marks painted on the road, especially pedestrian crossings, and multicolour marks on the road (they appear with rain), they are car oil and they make us skid easily. It is always is better to avoid the hours with worse visibility, such as when the sun rises, at sunset or at night. If you follow these tips, you will be able to enjoy your route and arrive at your destination dry and warm. Take the bicycle and go around the markets of Barcelona, there are a lot of choices! We propose up to 14 markets to pass through, where you will find all kinds of typical and non-typical products from Barcelona, all of them better than the habitual July sales. Markets have always been very important meeting places for the cities. There you can (would) find all kinds of curiosities and products of the gastronomic base of the zone. Barcelona is not only full of a great variety of markets; in addition, the majority of them are architectonic pieces which uncover part of the city history. So…¿Which would be a better way to shopping than visiting some of these emblematic markets of the city? If you really want to shop and taste some of the most delicious products of Barcelona, it is almost obligatory take a walk through one of the most famous markets: the Boqueria Market; although if it is far away from you or not within your tour, there are five more markets where you can find the best typical products: the Sant Antoni Market, the Santa Caterina Market (we will be impressed by its colourful roof), the Concepció Market, the Ninot Market or the Barceloneta Market. If, apart from the products, we are interested in modernist art from Barcelona, we can’t fail to go to the Llibertat Market, the Sants Market, the Galvany Market or the Sarrià Market. ¿And what if we are full and we want to look for clothes or other curiosities? The Encants Market of Glories is the best place to lose ourselves among clothes, handmade products, new and old objects… although if you prefer a place which is specialized in culture, the Sant Antoni Dominical Market is your place. And following the Barcelona traditions, you couldn’t miss the Flors Market in the Rambla. Besides these permanent markets, in Barcelona the tradition of second hand street markets has also increased. One of the most famous ones is Lost&Found. The next upcoming date is on the 20th of September at the Plaça del Mar (Barceloneta). Don’t forget your bicycle! With it you can plan a one day tour through the different markets, which we have proposed you, and in addition you can load all the things you have bought in a better way. In January the Department of Territories of the Generalitat de Catalunya made the information of the Barómetro de la Bicicleta (Bicycle Barometer) public, showing that 450.000 of the people in Catalonia daily move around with their bicycles, number which has maintained itself stable since 2011 and which has doubled itself compared to 2006. 450.000 of the people in Catalonia love pedalling to their job every day, a number which has maintained itself in the majority of the cities and which has increased 11.5% in Barcelona. With our strong legs, knowing the pleasure of moving around by this means of transport to our destination and being aware of the personal satisfaction which the fact of pedalling the bike every day means, how could we stop doing this during the vacation? Whoever rides the bicycle daily doesn’t do that only to go from one place to another. Besides being pleasurable, we also contribute to an improvement of our environment. Everything is advantages which we can continue enjoying during our vacation. We can discover new cities going through their streets faster than walking, saving time, but without missing little details, as would happen if we travelled by car or by public transport while we contribute to a responsible ecotourism which get us closer to the people who live in this city. During the summer, don’t park your bicycle. With it you can enjoy yourself much more. ¿What kind of relationship does the bicycle have with the economic and social crisis evolution of the last years? The crisis in the west had a demolishing effect on the major part of the families who had reached the middle class. The dream of a lot of people vanished and became a nightmare of receipts, mortgages, unemployment and inequality. For a lot of people this situation was unsustainable; others continued with the fight. They had to juggle in order to make ends meet. Some of the others bought a bicycle, we left the car or the motorbike behind and we saved on the ticket increases of public transport. And, finally, we realized that… Hey! We had also saved on gym expenditures. And while we were pedalling little by little against the unemployment, the abusive contracts, the rents, the mortgages… we began to see that we were not alone. Now, a lot of the others continue pedalling with the small sprocket and the large chainring, and ascending, but when some of our mates are faced with obstacles, we also pedal for them. And we realize that while we are pedalling we become stronger, much stronger than some people who continue driving their cars. And don’t be overconfident, because in the end we will feel the fresh air while we are riding our bicycle and we will be pedalling stronger and happier. There are some times that the terrain or the time that we spend in going from one point to another will impede us to travel comfortably on our bicycle. But there are some alternatives, like public transport, which will solve this problem, although we have to keep in mind when and how. Even though we haven’t any doubt about the bicycle being the best means of transport, we have to accept the fact that some distances or terrains cannot be crossed with the same speed if we go pedalling. For this reason, we need to calculate the time well and have to know which kinds of alternatives are available for us. In Barcelona, for, example, if we don’t want to give up the bicycle, because when we arrive at our destination it will be very useful, we can take the subway. Although we have to remember this: there are peak hours when we will not be allowed to board the subway with our bicycles: from 7 a.m. to 9:30 a.m. and from 5 p.m. to 8:30 p.m. (these restrictions are not applied during July and August). If you are interested in getting away from the capital city, we recommend you to take the train, Renfe, since some of the train cars have a place where we can leave our bicycles safely. There are some other means of transport, like the bus, but in this case, if we haven’t a folding bicycle, we cannot use it (because of an obvious question of space, of course). Anyway, even though it’s good to remember these other means of transport, we think that if you have the necessary time available, with the bicycle you will enjoy the route more and you will turn a simple trip into a nice journey. The daily use of the bicycle provides us with a great variety of advantages for ourselves and for our cities. 8 o’clock in the morning, you wake up, you dress, you have breakfast and… are you starting a new day? You take the car, you become stressed in the daily traffic jam; you look for parking place for your car in the infinite parking lot of your work; you sit at the same table and there you waste the next 8 hours only to return to the parking lot; to the car; to your home. You wake up, you dress, you have breakfast and… you take your bicycle; you enjoy the fresh air of the morning and the first sleepy faces; your muscles become more active in the same way that your mind does. And when you get to work you park just in the entrance. You sit in your chair at your desk, but this time you are ready for the next 8 hours. We have created a system where it is continuously more difficult to enjoy physical exercise and where the sedentary lifestyle is becoming something alarming. For these reasons it’s very important take advantage of every opportunity to move around. The bicycle, as well as being cheap, is one of the few vehicles whose speed depends on ourselves the major part of the time. Not even the traffic jams can hinder our route. In addition, we will save to the city the high levels of pollution that it usually has, and we will be able to enjoy it without bad smells and without exhaust pipes. Join everyone who is moving around by pedalling every day!